Harvesting cypress and other trees is an essential forest management practice, including sustaining forest succession, biodiversity, and forest health. A reality of sustainable forest management is that growing trees need sunlight, soil, and nutrients, and they grow more rapidly when older, larger, and more mature trees do not crowd them. Harvesting also helps prevent the spread of disease, pests, and wildfires, which disrupt the natural role trees play in the carbon cycle. A responsibly managed forest not only ensures that wood remains a sustainable resource, but also allows young trees to grow and store carbon. As architects build towards the 2030 challenge of net-zero energy construction, sustainable, carbon-neutral building materials, such as cypress, are of increased importance. For a natural carbon-neutral material, look no further than the nearest cypress stand. Science proves that wood products that are sourced from healthy (managed) forests are unique in that they have no carbon footprint. Simply put, more carbon is sequestered by a tree than is emitted over a wood product’s entire life cycle—through growth, manufacture, useful life, and disposal. Photosynthesis shows us that wood is a carbon-neutral material. While growing, trees absorb carbon dioxide from the atmosphere. The carbon used for wood fiber production is sequestered and stored while the oxygen is released back into the atmosphere. 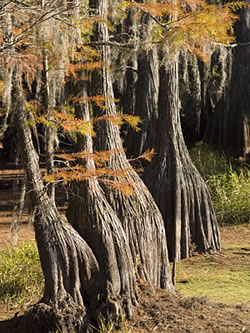 Carbon accounts for nearly 50 percent of the dry weight of a tree, and since cypress trees can grow to be 150 feet tall and 12 feet in diameter, the wood can lock in substantial amounts of carbon. In addition to being carbon-neutral, studies have shown that wood takes less energy to manufacture products from than other materials. Manufacturing wood products, such as cypress siding and paneling, is mostly limited to kiln drying and running a saw blade. Alternative building materials such as aluminum, plastic, cement and brick can require up to 126 times more energy to process into finished goods. At a sawmill, virtually every part of a log is used as lumber or a wood by-product. At the end of their useful lives, wood products are re-usable, recyclable, and biodegradable. When these products are returned to the earth or burned for fuel, the stored carbon is released and absorbed by growing trees—and the cycle is renewed again.